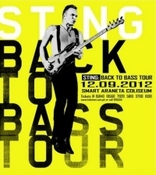 With a bass guitar slung over his shoulder, his fingers plucking, his hips rocking and his kicks languidly ''moon-walking'' (his own version), Sting (real name Gordon Matthew Thomas Sumner) can still teach a thing or two about dominating a stage and leaving a stadium filled to the rafters with fans screaming for more. At 61, the man who cheekily convinced the world that Tantric yoga leads to smoking in bed is possibly the most charismatic, and the sexiest, sexagenarian alive. It must be the powerful voice and the wicked, clever hands. As he took the stage at Smart Araneta Coliseum a little past 9 p.m. on Sunday, a sea of humanity rose to their feet and/or raised their own hands (cameras in tow) and voices in greeting, belting out the lyrics to the opener 'If I Ever Lose My Faith in You', followed quickly by 'Every Little Thing She Does Is Magic', both well-known and well-loved, the latter dating back to his years with The Police. This seamless switch from Sting the bandleader to Sting the solo artist happened again and again throughout the entire night, and the crowd literally went wild. They roared their approval in just the opening bars of 'Englishman in New York', 'Fields of Gold', and 'Shape of My Heart', all products of the solo artist. The same enthusiasm heralded 'Message In A Bottle', 'De Do Do Do, De Da Da Da', and 'Wrapped Around Your Finger' all from The Police files. Of the 21 songs performed, 'Heavy Cloud, No Rain' especially lent itself to crazed singing-along, Sting leading with the forecast of ''Heavy Cloud?'' and the crowd finishing off with ''No Rain!'' Quite taken with the vocal ping-pong, the singer complimented ''You're perfect!'' leading to more jubilation. Even songs that were less familiar - and less karaoke-worthy - were still hailed by the crowd, including The Police tracks 'Demolition Man' and 'Driven To Tears'; the two songs from his Mercury Falling album 'I Hung My Head' and 'The Hounds of Winter'; and the sweet little ballad 'The End of the Game' (introduced with a little incongruous anecdote about foxes eating one of the singer's chickens). This being the Back to Bass tour, the stage was completely stripped of flashy cameras or stage props, instead sporting a solid black background. Sting was as understated as he ever could be in a grey shirt and black leather pants, the same colors sported by guitarist Dominic Miller (who has played with Phil Collins), drummer Vinnie Colaiuta and fiddler Peter Tickell. The only spots of color you saw would be the blue shirt sported by keyboardist David Sancious, and the white blur of a twirling Jo Lawry on backing vocals. But the music was almost a living entity possessing the players onstage, echoed by the changing colors of the lights and the massive feedback from the cheering crowd. It's a habit of Sting to ''duel'' his own musicians, holding jamming sessions with one and then the other, in an almost sensual dance. But it's also a habit of his to drop back and let his partner shine, a bassist to the core, providing the backbone and the focus. And then, like a master conductor, he'd whip everyone up and orchestrate a full five-way sound. It doesn't stop there. Sting also changes genres on you within the same song, or auto-plagiarizes himself lyrically by sneaking in a sample of another song, or just runaway ad-libs nonsense phrases -- like “thrilla in Manila” - just because he felt like it. The finale of “Roxanne” must have been the longest ever performed, wave after wave drawn out, from slow sultriness to warm reggae syncopation, mood lighting from dark to full-on red to raging white, and the crowd loving it all the way to the finish. This concert had the same set list that the singer had presented on previous shows, including South Korea and Hong Kong (and down to the sudden appearance of a dancing mascot - the very same mascot endeared to the audience in Beirut, which garnered laughing puzzlement in the Filipino audience). The response of the crowd led to three encores: a set of 'Desert Rose', 'King of Pain', and 'Every Breath You Take', all crowd favorites, followed by 'Next to You', and finally, a heartfelt 'Fragile', the latter dedicated to the victims of the recent typhoon Pablo (international name: Bopha). It's safe to say that Manila - celebrities in the VIP section, the common folk up in the rafters with the lit advertisements, especially the tree-huggers that danced all the way from Pasay City to Cubao - sends that love back in spades.